(Bloomberg) -- North Korea withdrew from an office it set up with South Korea about six months ago that allowed the rivals to communicate around the clock, dealing a blow to President Moon Jae-in’s rapprochement efforts. North Korea informed South Korea on Friday that it would stop participating in the liaison office north of the border in Gaeseong city, Vice Unification Minister Chun Hae-sung told reporters. The North Koreans said they were “pulling out with instructions from the superior authority,” Chun said. North Korea has in recent days expressed irritation toward Seoul after leader Kim Jong Un’s nuclear summit with President Donald Trump broke down last month over U.S.-backed sanctions squeezing the country’s economy. The two Koreas agreed to open the office during a historic April summit between Moon and Kim, a signature achievement in the South Korean leader’s efforts to secure peace with Pyongyang. North Korea already began to raise the pressure last week, when one of its top diplomats said that Kim would soon decide whether to continue a halt on weapons tests that has underpinned his talks with Trump. Even before the summit, Kim had threatened to take a “new path” if Washington didn’t relax crippling economic sanctions. Chun deflected a question Friday about whether the decision was related to the U.S. talks, saying, “I don’t want to mention these things in relation to the Hanoi summit.” For the moment, the North Koreans took no steps to oust their southern counterparts from the office, saying, according to the Chun, that they were welcome to stay. The facility allowed for constant communication between the two sides for the first time since the start of the 1950-53 Korean War and was part of moves to reduce threats along the border, where the two countries have about 1 million troops in total stationed. The Unification Ministry said that other communication channels remained open. North Korea’s vice foreign minister, Choe Son Hui, last week blamed what she said was the U.S.’s “gangster-like” demands for the breakdown in Hanoi. While Moon has tried act as a bridge between Trump and Kim, Choe called her country’s southern neighbor “a player, not an arbiter,” because it was an ally of Washington. Earlier Friday, the North Korean news site Uriminzokkiri criticized the Unification Ministry as “cowardly” for cooperating with the U.S. on sanctions enforcement. The future of nuclear talks between the two sides have been in limbo since Trump decided to walk away from a Feb. 28 meeting in Hanoi without an agreement to reduce Kim’s arsenal. Each side has blamed the other, with the U.S. saying North Korea demanded too much sanctions relief and Pyongyang faulting Washington for rejecting its promises to reduce its nuclear program. Earlier this month, Moon praised North Korea’s offer to dismantle a key nuclear production complex as an “irreversible” disarmament step, breaking with the Trump administration. He also called for pushing ahead with inter-Korean projects currently hindered by sanctions and said the two sides discussed the “partial” lifting of sanctions -- backing North Korea’s version of events. 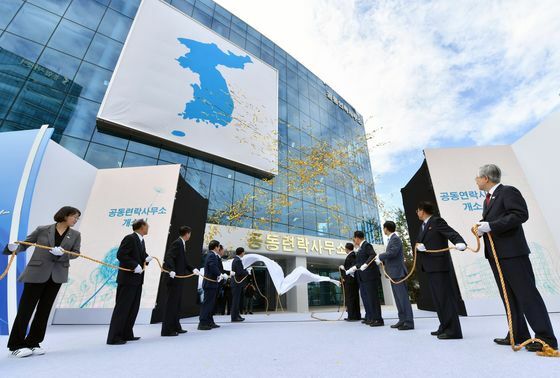 Moon’s government pinned hopes on the Hanoi summit for restarting the two projects frozen due to political acrimony -- a joint factory park in Gaeseong and a mountain resort in North Korea. The Gaeseong factory complex, which was supposed to be a model of economic cooperation for a unified Korea, closed about three years ago, depriving Kim of a source of hard currency.